I’d actually already bought Diving Into the Wreck once, a little over a year ago, as a gift for a friend who seemed to really love playing with language. I was frustrated when I discovered the book wasn’t in stock today, mostly because this friend and I are no longer speaking and I find myself sometimes in situations where I give a book to someone I love and then they leave and I miss them, but I also miss the hole that is the book that they have and I don’t. 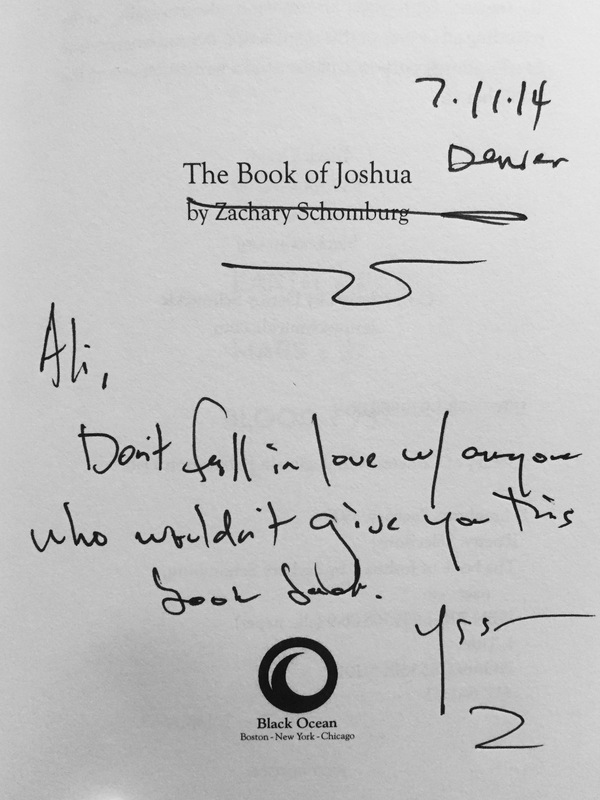 This is such a consistent thing that ZS wrote it in a note to me when I bought his most recent book of poems a two summers ago. Don’t fall in love with anyone who wouldn’t give this book back. one’s books–one’s bookshelf, one’s library–create a kind of self-portrait. Of course, this is true, just as one’s patterns of acquisition–of all things–form a graph of one’s movements, activities, interests. Every thing is an element in a life story, however interesting or banal. I visit a friend in her office, another in his home, I am looking at every thing, the books on the shelf to see what she is reading, what I may have missed, the pictures on his wall, the curiosities on the coffee table, trying to piece together the story. Someone came over to my apartment for the first time the other day and remarked that my bookshelf is expansive. I live with this bookshelf all the time and often forget that it’s weird for books to be the most visible, prominent feature in a person’s house. I maybe forget this because my friends, too, are writers and teachers and critics and so usually also boast an extensive collection of books. Jake had thousands. I remember his offices, both home and at school. But I never felt like it was enough books. It was always just a beginning. Skylight didn’t have The Battlefield Where the Moon Says I Love You, so I tried to order it but couldn’t. I wasn’t ready to leave, so I wandered my favorite sections a bit: essays, theory/philosophy, literary criticism. I found bell hooks’ All About Love and bought it. 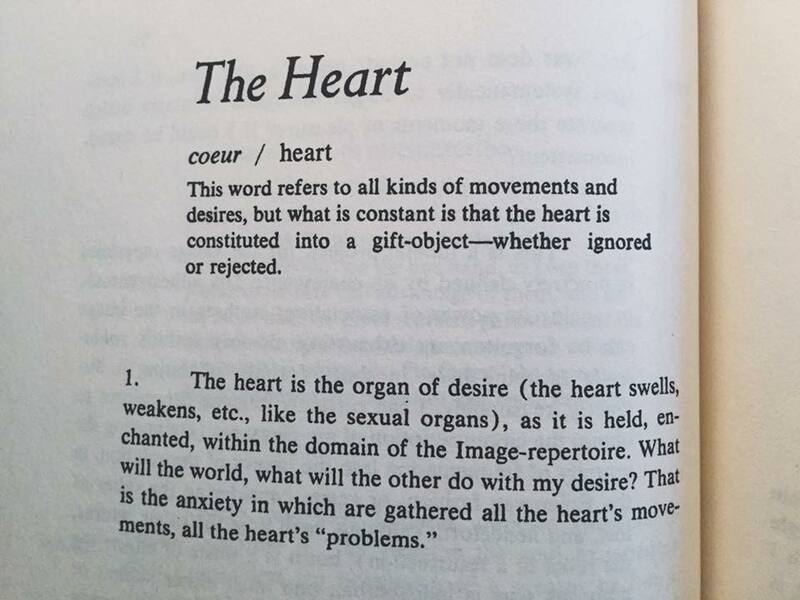 I found Roland Barthes’ A Lover’s Discourse, but did not buy it as I have already bought it four times: once for me, once for my brother, and once for my two best friends. Both books have black, white, and red covers. Both are the same size and almost the same thickness. 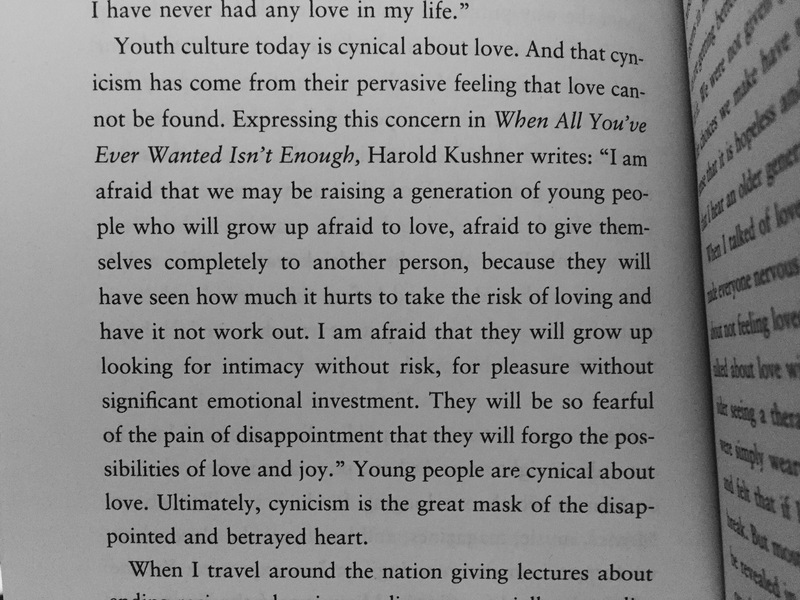 I noticed a trend recently when I was visiting New York that I was suddenly very focused on the idea of love. I’d just published an essay in Modern Love, and subsequently went back through their archive and read. When I packed my bag for New York, I grabbed A Lover’s Discourse, which I hadn’t read yet. 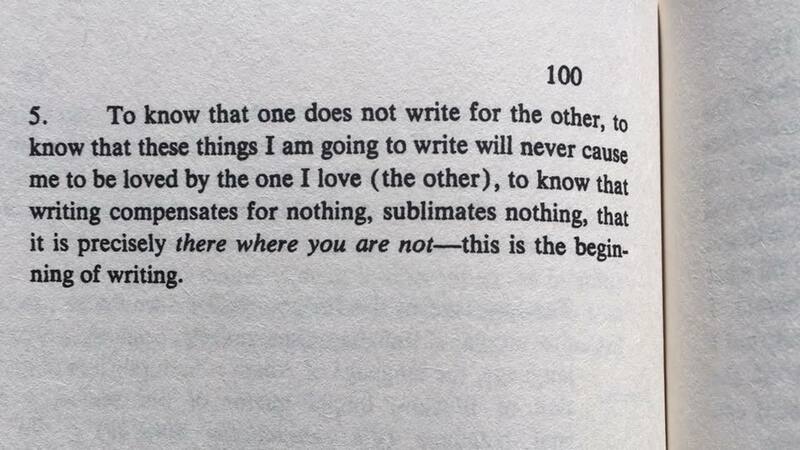 When I was in New York, I went looking for Marguerite Duras’ The Lover, but mistakenly (stupidly), bought L’Amour instead of L’Amant. I read it alongside Barthes and tried to ignore what this recent combination of texts was saying about where I am at right now. But today when I bought All About Love, there was no denying it. 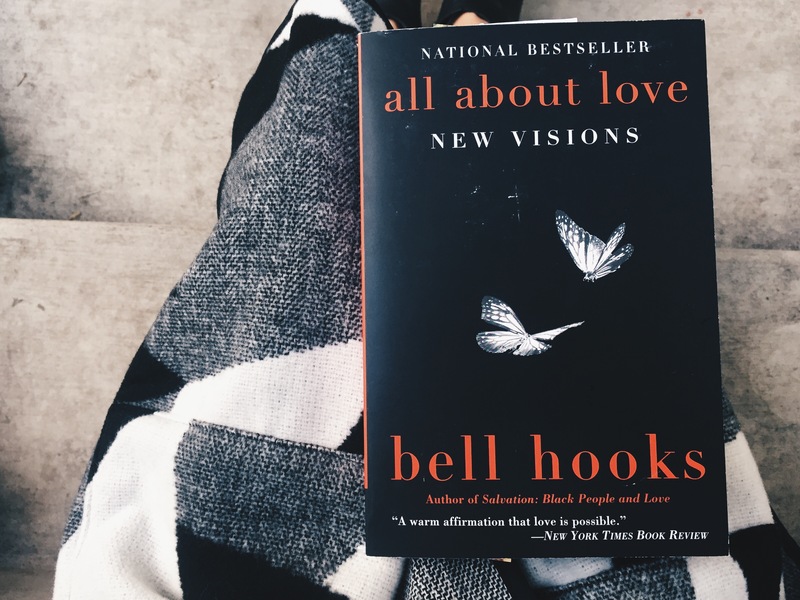 Love is very much on my mind in a way it never has been before, and as I began reading hooks today, I realized it’s because for the first time in my life, I’m not in love. 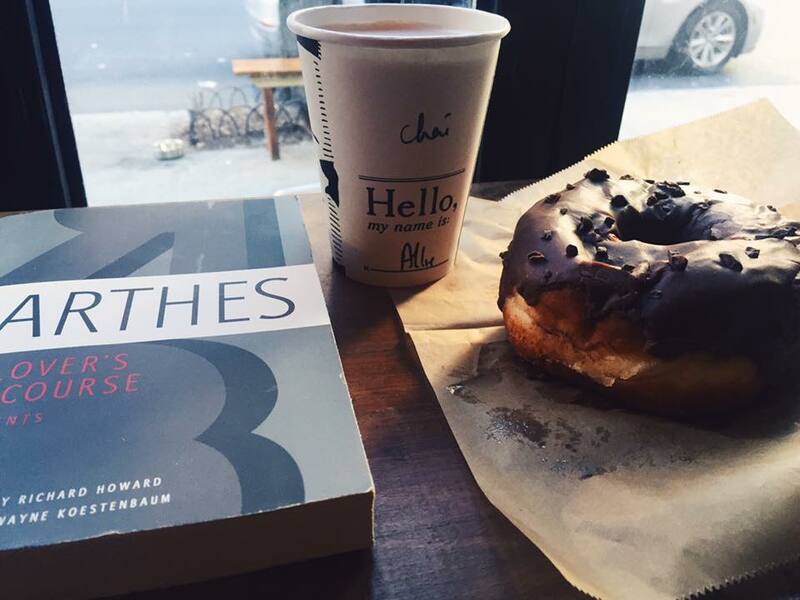 For years I consumed romance plots like I consume donuts, which is constantly and with only the slightest tinge of shame. I consumed love because I was in love. All the time, I was in love. Mostly just with one person for over a decade of my life. I could sink into a good love story and imagine myself getting caught in its tide, the perfect narrative tossing and molding my less than perfect narrative into a happy ending. When I sat on the plane to JFK reading A Lover’s Discourse, I found myself making notes in the margins about experiences I had with love that I recalled when reading various passages. These notes all had to do with someone else, not the decade long love, and that surprised me. That I can’t reach that other love anymore, at least not in sensation of memory. I could barely even reach the newer love, except for in small bits that I was simultaneously trying to suppress. It was strange and a little exhausting to read about love in such detail when I couldn’t emotionally connect to the words on the page. Where was this book five years ago, I thought? How I would have clung to it then. But I like the idea of looking back at this time in my life by looking at an imaginary autobiographical bookshelf and seeing what I was reading next to what else I was reading at this particular moment. My books and the order in which I read them and how they are pressed up against one another in my imagination shapes my experiences of the world just as much as my experiences of the world shape how I read these text. Reading about love from outside of love is a wholly new experience for me and when I look at these few books next to each other on the shelf, I will remember the me that was on dry land for once, not flailing and desperate to be fulfilled. Someday it will be a good reminder of one of the many versions of myself I can be when I look back from future moments where I am someone different. Here are some choice excerpts from the two aforementioned books. That last one especially seems to encapsulate the majority of my experience of being a human on this earth thus far. I always used to sing the same Radar Bros. lyric to myself again and again, paper and ink/never will bring me to you.